NextGen Player - Canada's Premier Entertainment Blog: Link Up with PlayStation! So I was checking my email this evening and received the following email from PlayStation Underground. 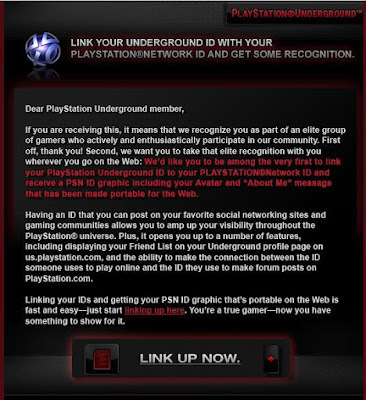 It is an advance invitation for me to link up my PlayStation Underground ID to my PlayStation Network ID and also receive a PSN ID card graphic that I can proudly show off...um...once I get some trophies under my belt that is. Finally Sony has got with it and realized that PlayStation gamers with both an Underground and PSN account should have a unified account access to all of their PlayStation content online. I'm linked up and good to go!